Free Printable February 2016 Calendar. Free Printable February 2016 Calendar, a great printable for planning and organizing at work, school, or at home. 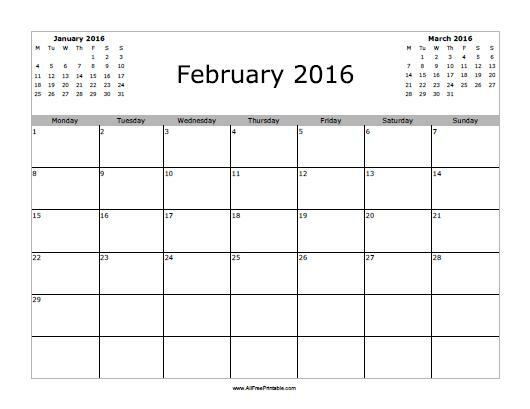 Getting organized and planning this month can be easy with a Printable February 2016 calendar. Select and print a calendar starting the week on Monday or Sunday. Write and plan everything on the free printable February 2016 calendar, like Valentine’s Day, friends party, romantic dinner, birthdays, romantic dates, celebrations, romantic vacations, things to do next week and more. Use the link of your choice to download or print now.